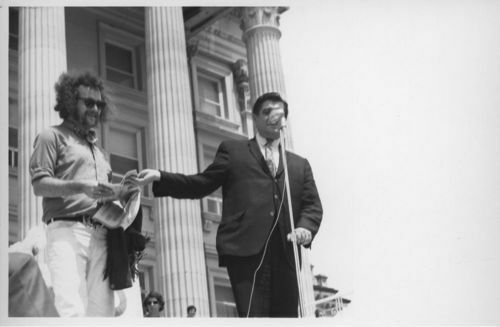 This black and white photographs shows Kansas Governor Robert Docking with a man during an anti-war rally on the steps of the capitol in Topeka, Kansas. The governor spoke before a crowd of about 1,200 college students who were peacefully demonstrating against the United States' involvement in Cambodia. During the rally, the students asked that the Governor call for a special session of the legislature to consider an anti-war proposal. The proposed legislation would make it unlawful for Kansas citizens to fight outside the United States without a declaration of war by Congress. Governor Docking met with students and accepted their petitions for the special session, but no further action was taken toward the request.